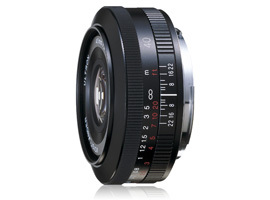 The Voigtlander Ultron 40mm f/2 SL II Aspherical (Voigtlander 40mm f2) is a manual focus, ‘standard’ focal length prime lens available in Nikon and Canon mounts. Compatible with virtually all Nikon/Canon DSLRs and film SLRs, 40mm on full frame bodies offers a great focal length for a range of subjects including candid and street photography. On smaller crop sensors, the focal length extension to around 60mm makes it a little less versatile, but good for portraiture, particularly utilising the fast f/2 aperture. Despite being a manual focus lens, electronic coupling to DSLRs means metering, exposure and ISO data is passed to the camera, making the Voigtlander 40mm f/2 a very usable lens for DSLR photographers. The Voigtlander 40mm f/2 build quality and size are its big attractions as it feels like it’ll last a lifetime and at just 24.5mm in length and weighing 200g it’s very petite. Compare that to Sigma’s 35mm f/1.4 prime for example which, at 94mm in length and 665g in weight, is almost 4 times longer and over 3 times heavier. The Voitglander 40mm f/2 comes supplied with close-up lens adapter to reduce the minimum focus distance to 25cm and a magnification ratio of 1:4. The supplied lens hood also doubles as a 52-39mm step down filter adapter. 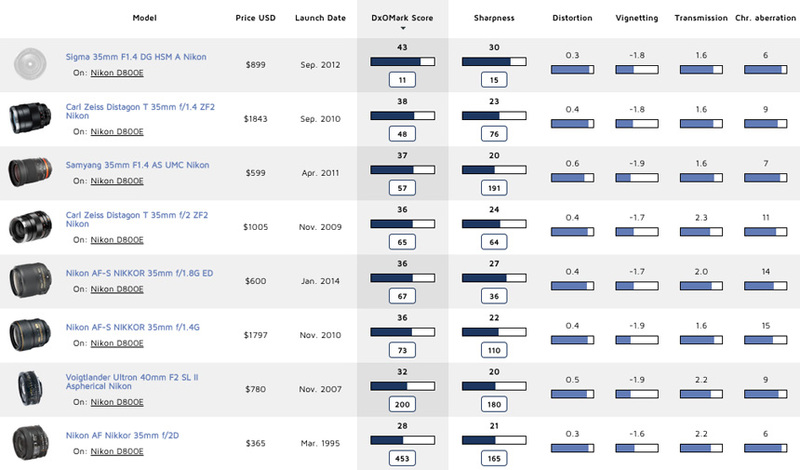 Achieving an overall DxOMark Score of 32 tested on the Nikon D800E and 25 on the Canon 5D Mark III, the Nikon version ranks a little higher in our database. 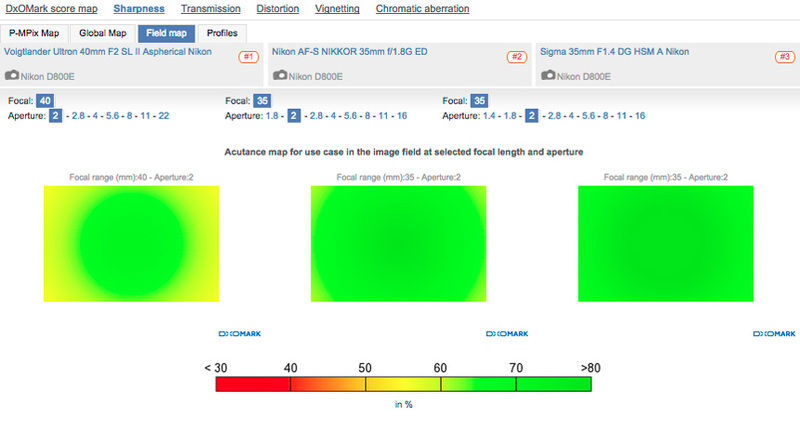 Analysis of the Lens Metric Scores identifies that both versions post very similar scores in all sub categories, with the exception of Sharpness where the Nikon version triumphs with a score of 20 P-Mpix, compared to 25 P-Mpix for the Canon. 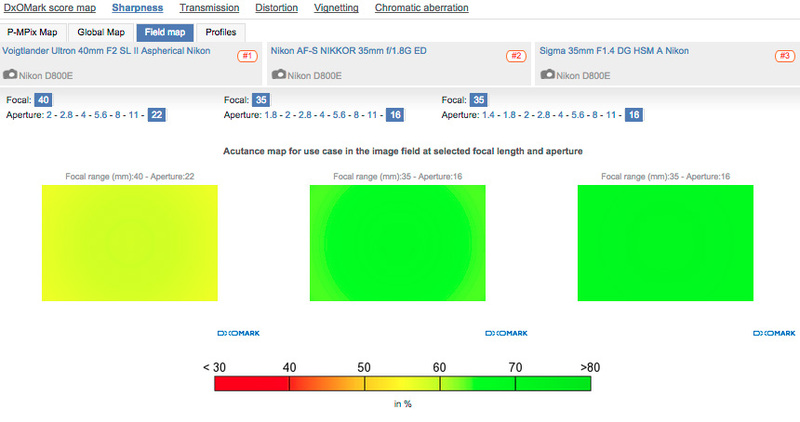 Bear in mind that this advantage for sharpness is a result of testing the Nikon version on the higher resolution sensor compared to the Canon version however. Tested across all Nikon DSLRs, the Voitglander 40mm f2 posts its highest score of 32 on the 36Mp D800E with a low score of 11 on the Nikon D70. Its top score of 32 ranks in 200th place overall on the database for all lens/camera combinations and its highest Sharpness result of 20 P-Mpix is marginally better at 180th overall. The Voigtlander 40mm f/2 Nikon overall score of 32-points ranks in 37th place for all lenses tested on the D800E and 13th for standard primes with a focal length between 35-50mm. 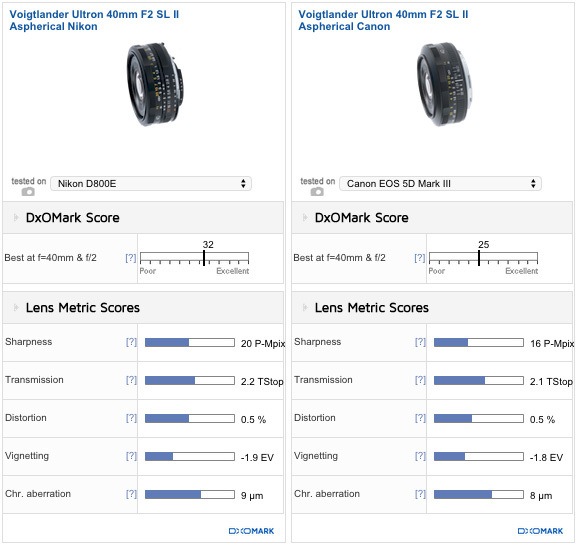 Against other 35mm prime lenses tested on the D800E, the Voigtlander 40mm f/2 ranks towards the bottom of the list, only beating the Nikon 35mm f/2D with its score 28-points. For Sharpness in the 35mm category the Voigtlander 40mm f/2 doesn’t perform any better and again ranks towards the bottom, with a joint low Sharpness score of 20P-Mpix alongside the Samyang 35mm f/1.4 AS UMC. The Canon version achieves its highest score of 25-points tested on the EOS 5D Mark III and 1Dx, with a low score of 12-points on the older APS-C EOS 450-D. Its top score of 25-points ranks in 855th place overall for all lens/camera combinations and its lower Sharpness score of 16P-Mpix ranks in 496th. Out of all lenses tested on the EOS 5D Mark III the Voigtlander 40mm f/2 ranks in 46th place out of the 63 lenses tested, so again towards the bottom of the spectrum. 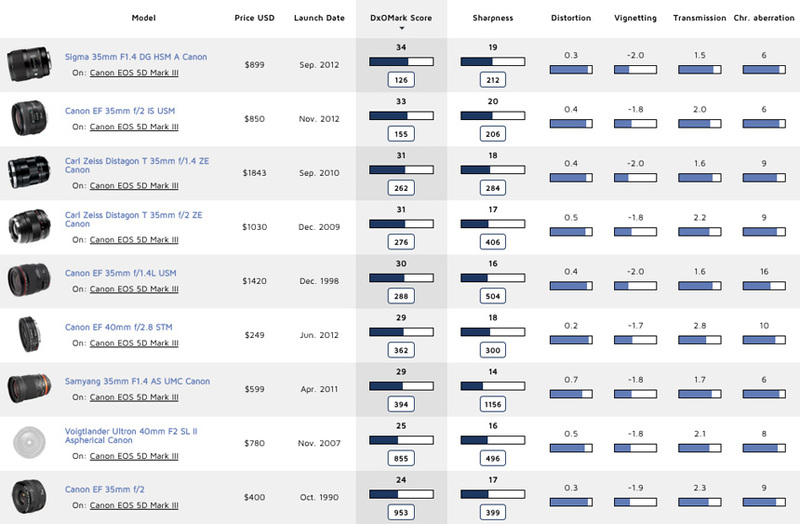 For standard focal length primes between 35-50mm on the 5D Mark III it ranks 14th, although a slightly improved performance for sharpness puts it into 10th place in this category. 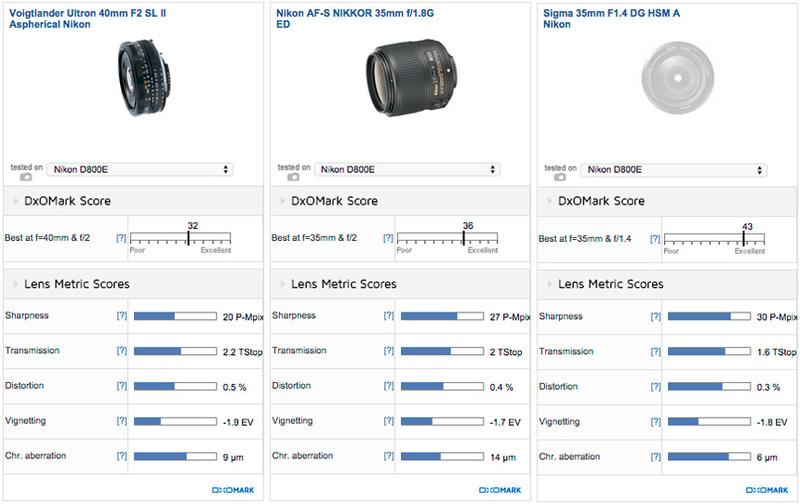 Similar to the Nikon version, head to head against other 35mm/40mm primes, the Voigtlander 40mm f/2 charts towards the bottom of the table, far behind the Sigma 35mm f/1.4 A with 34-points and the Canon EF 35mm f/2 IS USM with 33. With no other 40mm primes tested on the Nikon D800E we’ve pitted the Voigtlander 40mm f/2 against the popular Nikon 35mm f/1.8G and the outstanding Sigma 35mm f/1.4 A for a comparison. As noted, the Voigtlander 40mm f/2 is the smaller, lighter lens out of the three, but posts the lowest Transmission score of 2.2 TStop, with the Sigma 35mm offering over ½ stop better light transmission. There’s very little between these three lenses for Distortion and Vignetting, but the Voigtlander 40mm does fare better than the Nikon 35mm f/1.8G for Chromatic Aberration. The Voigtlander displays less fringing at all apertures compared to the Nikon, but it isn’t as strong as the Sigma even at the Sigma’s wider maximum aperture of f/1.4. At each lens’s maximum aperture setting the Nikon and Sigma primes are both marginally sharper and more homogenous across the frame, compared the Voigtlander. Stop all three lenses down to f/2.8 and all the Voigtlander’s sharpness is now almost homogenous, but its resolution isn’t as strong as the Nikon or Sigma at this setting. 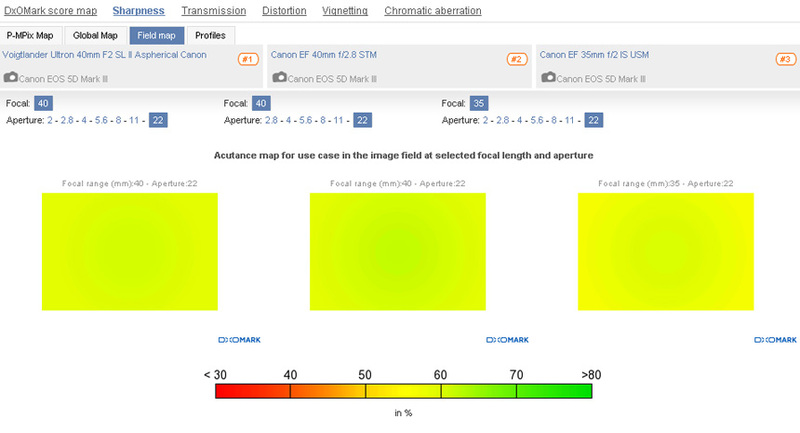 Finally for Sharpness, at each lens’s minimum aperture setting of either f/22 or f/16, all three are homogenous but the Canon and Nikon are sharper. For Canon shooters the EF 40mm f/2.8 STM pancake lens is a similarly petite standard focal length option and we’ve also added in the Canon EF 35mm f/2 IS USM for our comparison. The Voigtlander 40mm ranks in 3rd overall but in terms of the Lens Metrics there’s very little between the three for their Vignetting or Chromatic Aberration scores, so it’s Sharpness, Transmission and Distortion where we see some differences. The Voigtlander 40mm f/2 and EF 35mm f/2 offer better Transmission, almost 1 Stop better than the EF 40mm thanks to their wider f/2 max apertures, for a brighter viewfinder display. Distortion is controlled better on the EF 40mm pancake however, with less barreling. For Sharpness at the maximum aperture of f/2, the EF 35mm f/2 offers notably better resolution in the centre compared to the Voigtlander, which although more homogenous across the frame isn’t as sharp overall. At f/2.8 the EF 40mm pancake is actually marginally sharper with strong homogenous resolution across the frame compared to the Voigtlander 40mm f/2, with a small amount of edge softness visible on the EF 35mm f/2. The Voigtlander’s sharpness is strong between f/4 – f/11 however, which oddly is where the EF 40mm pancake drops off a little bit in the corners. 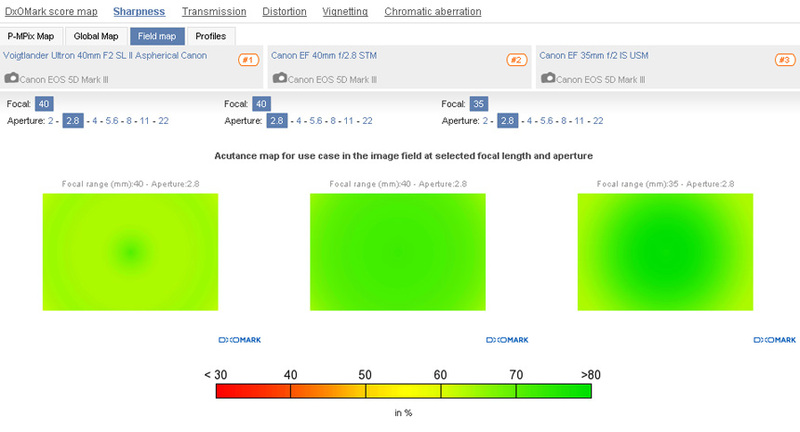 At the minimum aperture of f/22 all three offer similar levels of sharpness for longer depth-of-field shots. The Voigtlander 40mm f/2 offers an interesting alternative for Nikon and Canon shooters looking for a standard focal length prime. Its main draw will be its petite dimensions that make it a lightweight, convenient and discreet shooting option. The 40mm focal length isn’t very common in primes however, with many manufacturers favouring the wider 35mm or longer 50mm alternative, but 40mm is actually a very versatile middle ground that works well with lots of subjects. In terms of our lab tests the Voigtlander 40mm f/2 isn’t quite as strong as much of the competition however. Given its size the Voigtlander does produce some good results but it’s off the pace compared to the outstanding Sigma 35mm f/1.4 A, if you can cope with its bigger and heavier proportions. The Nikon 35mm f/1.8G offers notably better edge sharpness at f/2 as well as autofocus, but again it’s a bigger and bulkier lens. 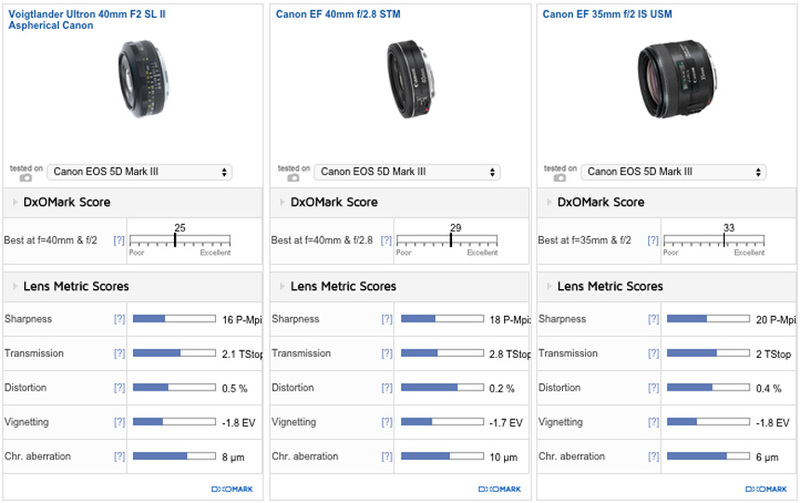 On Canon, the small EF 40mm pancake is marginally ahead of the Voigtlander overall, but again the bigger lens in the shape of the EF 35mm f/2 wins the day in terms of performance offering the best results for sharpness overall.